Reflecting the political and social distrust was not a major factor during the production of Night of the Living Dead, but the iconography of the Vietnam War and civil rights issues seeped its way into the film, giving unsuspecting audiences a horror film with an intellectual bent. 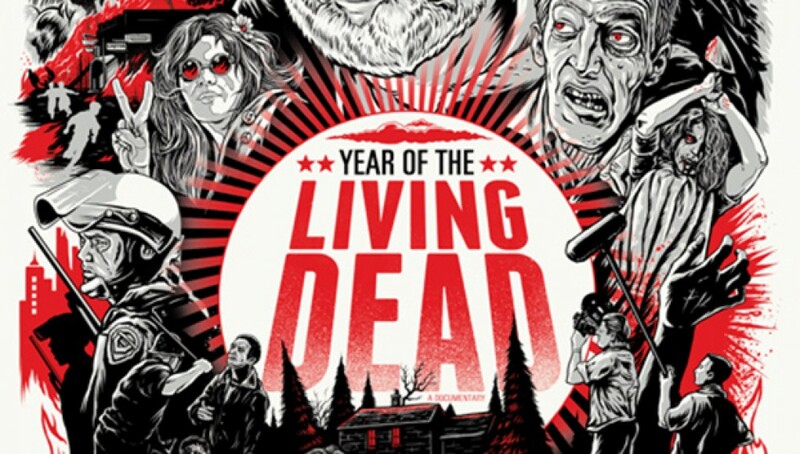 Year of the Living Dead chronicles how the film became a community effort to produce the seminal Zombie film, while offering a close reading of the historical context that made the film a classic. George A. Romero was a college dropout who just wanted to make movies. He found himself in Pittsburg, PA making short films for Mr. Roger’s Neighborhood as well as commercials for clients. After one commercial required Romero’s company to purchase a 35mm Arriflex camera, Romero scraped together some money and a community spirit in the working class city to film the ultra-low budget Night of the Living Dead after finding inspiration from the novel I Am Legend. Featuring crew members, even investors, filling in as zombies and local personalities to join in on the production, what transpired was a community effort that would inadvertently reflect a political and social context surrounding the Vietnam War, mistrust in the government, and increasing racial tensions. Although many of the decisions made before and during the production of the film were made with practicality under a tight budget, critics, filmmakers, and historians see the film having a controlled statement about the role of violence in the media, the growing racial tensions, and even as a comment on the B-movie horror trend of the 1950/60s. By the late-1960s, horror films became increasingly intellectual with Roman Polanski’s Rosemary’s Baby and Repulsion. Critic Elvis Mitchell, Historian Mark Harris, and filmmakers such as Sam Pollard and Larry Fessenden provide close readings and political context. Harris, whose book Pictures at a Revolution explored the production histories of the films nominated for the 1968 Best Picture category at the Academy Awards showed how the slap in In the Heat of the Night resurrects itself in Night of the Living Dead. It is not only critics and historians who are presenting close readings of the film to the audience, one elementary school teacher is working with students at a Brooklyn public school in an effort to teach literacy through film. He shows Night of the Living Dead to his elementary school children who mimic zombie behavior but are also taught vocabulary and the inherent literary themes that exist in the film. 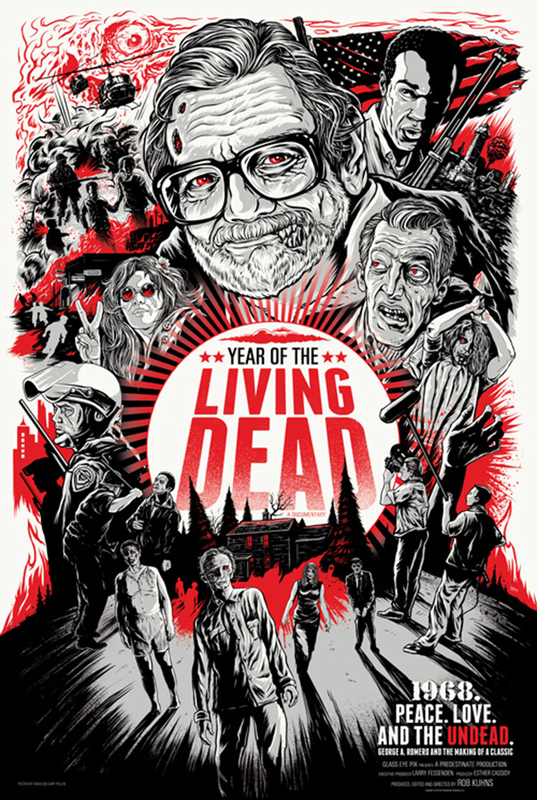 Year of the Living Dead focuses solely on the production and reception histories as well as critical interpretation of the singular film, but does not touch upon the sequels, remakes, or the culture that arises out of this seminal film. Of course the zombie subgenre has exploded these past years as the television show The Walking Dead has become a cultural phenomenon, zombie walks and conventions have become yearly events, and zombies in general have become beloved beings of the living dead. What the documentary truly lays out is that the film became an origin for a subgenre that has exploded over the past years, but the producers of the film did not actively engage in the social and political undertones of the film (Although it is deliberate in later sequels). Romero was trying to relate the same revolutionary theme in I Am Legend, but the theme of most zombie films rarely focus on the zombies themselves. Instead, the zombies become an unstoppable force that is essentially a red herring, and the true conflict almost always becomes man v.s. man. Since Director Rob Khuns chose to focus solely on this film, it gives plenty of room for others to come in and complete the rest of the historical and cultural impact The Living Dead franchise, its remakes, and its parodies. Night of the Living Dead is a testament to both low-budget horror films by a mostly working-class community that simply wanted something to be proud of. The film not only represents the working class’s susceptibility of infestation but also the futile attempt of humans to work together in confusing and tremulous times. Yet, Year of the Dead not only offers a comprehensive look at a cornerstone film and its relationship to society, but a counteraction to that same very notion of anti-cooperation. It took a passionate community to create this film out of thin air, where these zombie films tend to portray humans unable to collaborate against an overwhelming threat.